You may already know what a garment factory is in the apparel and fashion industry. Garment factory is a place where complete garments are made from the fabrics following a chain of processes. A process flowchart will give a better idea of how things are done in a garment factory. As mentioned in the title, this article will show you the different departments of a garment factory. Departments are set-up based on the group of activities to be performed by a team of people. Further, we will see the various functions of the different departments of a garment unit. Garment manufacturing is a complex process which starts with sample development and end after shipping the finished garments to the buyers. Here is the list of garment factory departments. These departments include the pre-production departments, production and post-production departments. The supporting departments are also listed here. Activities of different departments explained here are followed by garment export houses as well as domestic garment manufacturers. You can set job profile of your employees based on these and if required you modify the same. If you don’t want to read the whole post and want chart for understanding primary job responsibilities of the different department, see the infographic. The marketing department in a garment company is responsible for marketing products made by the factory, finding new customers and bringing more and more orders for the company. A marketing department is headed by the marketing manager and supported marketing team. They meet with prospects and existing buyers. They show their latest product development (designs) to the buyer. They are given responsibility for business development for the company. This department showcases factory’s ability for developing new designs, factory compliance, and quality policy and quality performance. Most common marketplace for manufacturers is international apparel shows and exhibitions, where buyers and sellers meet to find each other. In the exhibition, buyers pick their interesting design and place order if their target price is met. In this internet age, garment factories build websites for marketing purpose and increase their visibility to potential customers. Small factories post their product in online yellow pages and do content marketing to reach a bigger market. Social Media like Facebook, LinkedIn and Twitter are used as marketing tools. More than just developing new clients, retaining the existing customer is also important. To retain your existing customers, you need to satisfy your customers by shipping quality products and timely delivery and providing quality services. The main mantra to retain customers and making them marketer for you is to deliver more than you are paid for. Deliver more than commitment and customer expectation. Apparel design department is responsible for product development. They focus on developing garment designs in similar product categories the company does its business. Designers develop new design collection every season. Designers make designs as per the latest trends and buyers test. For big manufacturers, the designing department plays an important role in retaining customers by showing new designs to their buyers in every season. Designers develop a library for fabrics, trims and accessories, and for garments. Apparel retailers and brands those have own manufacturing set-up, normally set up the design department for developing new designs. Merchandising department works as a mediator in between factory and buyers. This department is considered as the heart and soul of the company. They coordinate with buyers for orders, send garment samples for buyer approval and receive comments on samples and other approvals. Merchandiser prepares the bill of materials, prepares garment costing sheet and follows up of production activities. Merchandising department is formed with a team of senior merchants and junior merchants. Where factories work with many buyers, each merchant is allocated specific accounts with a couple of buyers. In bigger factories merchandising team is given specific responsibilities as sampling merchant and production merchant. Based on their profile, sampling merchants look into sampling activities and communicate with buyers only for sample development and queries on sampling. Production merchant is involved in merchandising activities related to bulk production, planning, sourcing and production follow up. Pattern making department makes garment patterns and digitize patterns to CAD. CAD stands for Computer Aided Design. Pattern making department is headed by Pattern master. Pattern making department is also known as the technical department. Sampling department makes all kind of samples that need to be submitted to the buyer. Sampling department checks fit of the sample. Sampling department communicates problems related to orders to the production department. Reading garment spec and understanding workmanship of the garment. Making garment samples by following complete processes of cutting, sewing, finishing and checking. Measurement all samples and check the quality of the garment samples. Prepare quality inspection report for measurement and visuals. Fabric shrinkage test is done in garment form. The fabric store is handled by Fabric in-charge and the in-charge is assisted by a team of helpers for loading and unloading fabrics and issuing fabric to cutting department. Fabric department receives and stores all kind of fabrics. Fabric rolls are kept in the rack or on wooden pallets. Like fabric store, this store receives all kind of trims and accessories and store in racks. Small size factories, fabric and trim store are headed by the same person. And the functions of this department includes followings. Arranging trims in racks or bin to get trims easily when the request received from someone. Production planning department is responsible for planning and scheduling orders. This department is known as PPC department. They execute production and do follow with all production processes. Production planning and scheduling of activities are essential to procure raw material on time, complete production activities on time and able handover shipment on time. Small size factories do not keep a separate department for production planning. Merchandisers do planning of pre-production activities and production head prepares a production plan. Factories those have separate PPC department, following activities are carried out by them. Learn more about PPC in the apparel industry by reading my book on this subject. This department is responsible for cutting of fabrics and feeding sewing department with cuttings. Cutting department’s capacity is planned as per daily feeding requirement to the sewing lines. Cutting department set up with cutting department head, cutters, spreaders, quality checkers, and helpers for sorting, ply numbering and bundling. Main jobs of the sewing department are stitching of garment. 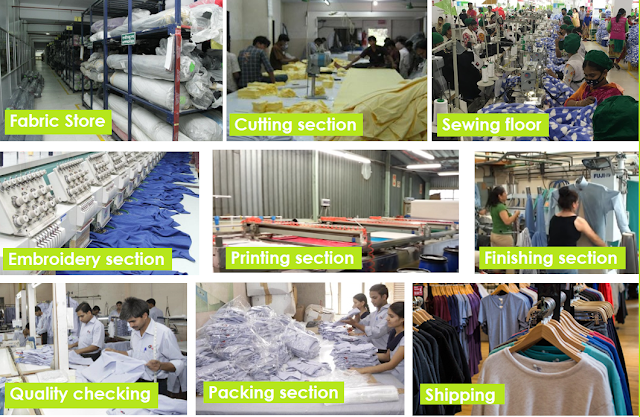 In the sewing floor, various types of production systems and line layout are used. Factories either work in an assembly line or group system. Major tasks of this department are as follows but not limited to these only. Industrial Engineering department assists production department in setting line, improving production and measuring production performance. Major activities of Industrial Engineering department are product analysis, making operation bulletin, calculating garment SAM, making line layout and workstation layout. They capture production data and prepare daily production report. Develop detailed production methods, from detailed manual movements to major decisions on technology. Documentation of all methods using manuals, computer-based system as appropriate. If you planning to set up a garment factory, you must consider employing industrial engineers. Don’t fear about extra manpower cost but you will get a return of it. You have to utilize IE’s skill in product and production planning. Sometimes garments need to be washing after stitching to remove dust, tracing mark and to give a washed look to the garment. This department washes the garments, cut panels (if required), wash garment samples as required. Stitched garments are finished prior to packing into poly bag. Major activities of a finishing department include thread trimming, checking of garments and ironing. Packing department in a factory works side by side of the finishing department. Folding, tagging and packing of garments are done in the finishing department. Based on product categories finishing room activities may vary. Responsibilities of the quality control department may vary organization to organization but main activities almost remain the same. Activities of the Quality control department are as follows. Auditing inward fabric and trims and ensuring only quality goods are accepted. Involvement in product development and sampling stage and take care of quality aspects of samples. Ensure that no faulty fabric is sent for cutting. If a minor fault is present in the fabric, defects should be marked on the fabric and the same thing must be communicated to the cutting department. Preparing the audit report of the fabric and trims quality. Conducting pre-production meeting before production start. Departments if a garment factory those are no directly involved in garment production but support garment production team to perform their work smoothly. Necessary supporting departments are Accounting, EDP, Shipping and documentation, Human resource and Administration. Accounting department prepare payroll for employees, give payments to workers and write checks for staffs. They manage accounts of the company. Maintain records of supplier payment and follow up with buyers for pending payment. This department is involved in all kind payment and cash management. This department is concern about the social issue of the employee. They look after recruiting and employee welfare. This department maintains employee attendance and absent records. Garment factories use many electronics items such as computers, printer, Barcode systems etc. Computers are used for daily activities like mailing, making reports and accounting software, EPRs etc. An EDP department is necessary for troubleshooting of the computers and software. Shipping and documentation department prepare shipment related documents. They communicate with buyer for shipment dispatch and send shipment to buyer. Note: The list of garment factory departments shown in this article are commonly found in the average factories. It not necessary that all garment manufacturing companies will have all these departments. In small-scale factories activities of multiple departments are given to a department to reduce overhead. I hope you find this long post helpful and valuable. Show your love and share this article with your friends. List of different departments in a garment factory and their primary functions are covered in this article.